An open source. digital resource, Dezède is a web application which offers contributors and readers free and electronic access to published data. It is responsive and adapts to different formats. Dezède is also a valorisation portal: while assisting researchers in their work, it faciliates the publication of results and places them within a broader contributory perspective. A research and development tool dedicated to the archiving and chronology of performances. Dezède enables the reconstruction and organisation of theatre programme collections, allotted to towns, institutions, artists or works. To do this, it uses an innovative scientific method to structure the on-line publication: treatment and analysis of sources, critical edition of programmes and classification of events. At the heart of the application is a relational database which links the events to a group of authority records that can be interrogated separately (works, individuals, ensembles, performance sites, roles, occupations, etc.) A unique application in the domain of digital humanities, Dezède's purpose is to foster the development of research on the circulation of works and performers, by providing researchers and the public with a wealth of historical data. Dezède is an online resource identified by ISSN number 2269-9473, making available to researchers the tools necessary for the publication of dossiers. Each project is submitted, appraised, validated and monitored by the editorial committee. Their role also involves structuring the publication and to control the methodological and technological evolution of it. The creation of three teacher-researchers: Joann Élart, Yannick Simon and Patrick Taïeb, musicologists at the Université de Rouen and Université Paul-Valéry Montpellier 3. They share a co-ownership agreement with their laboratory – the GRHis (EA 3831), the CÉRÉdI (EA 3229) and the IRCL (UMR 5186 du CNRS) – and their affiliated university. Hosted on the servers of the TGIR Huma-Num, Dezède is an open source online resource, ISSN reference number 2269-9473. The first phase of development was made possible thanks to the financial support of the Université de Rouen and Université Paul-Valéry Montpellier 3, associate laboratories and the Région Normandie via the GRR. In terms of responsibilities, Joann Élart is in charge of co-ordinating the methodological and IT development, Yannick Simon deals more particularly with legal affairs, Patrick Taïeb is in charge of the concert repertoire project. Base your chronology of performances on a region, an institution, a career, or a work. The dossier is the completed form of a publication in Dezède: it is a corpus of events or images, created and compiled by one or several scientific editors who ensure(s) the production of it. The aim of the events dossier is to reconstruct the schedules of performances in a geographical area and period of time, to establish the programming of an institution, to follow the career of a performer, singer or actor, or to follow the dissemination and reception of a work. The events are presented in chronological order. Submitted to the expert editorial committee, the dossiers are classed according to an order established by a general table, which will evolve depending on new contributions; A set of visualisation tools is proposed in addition to the event chronology (maps, broadcasts, historical timeline, diagram of the strings). The dossiers produced in Dezède can be exported in their entirety in PDF format, with the page layout generated automatically. They can thus form an archive or an appendix to a university dissertation. At the heart of Dezède, there are thousands of authority records that everyone can access ! The application's flexibility and the homogeneity of the publication arise from the pooling of interrelated authority records by a relational and recursive management system: events, works, individuals, ensembles, places, roles, instruments, professions, etc. The authority records are subject to a scientific control based on the cross-checking of reference material. The rule: at least one source per event. The publication of a chronology in Dezède follows a principle dear to the historian: critical transparency. It is why the programme imposes a sine qua non on the user: the creation of an event is only possible if it is linked a minima to one source. The editorial procedure suggests moreover to start work by creating a source that then needs to be linked to an event. Sources come in different types: periodicals, archives, correspondence, memoirs, ephemera, images, audio, videos. They are presented in different ways: from a simple bibliographical reference (particularly for archives) to a partial or full diplomatic transcription (searchable in plain text via the search engine), from a hyperlink to permanent electronic resources to the publication of digitised images that can be viewed in an online flipbook. Researching events in Dezède: there's nothing easier ! All you have to do is visit the «events» menu and use the filter. This allows different sorting queries to be cross-checked: free search, period, sort by calendar year or season, place, work, individual, ensemble. Search in the whole of the contents. The search engine is permanently attached to the menu bar and allows you to search the contents of Dezède at any time: dossiers of events, events, individuals, ensembles, works, places and institutions, sources, events, roles and instruments, professions. The search can be carried out in two different ways: by a free search: typing one or more key words; by an advanced search: selecting one or more filters. Dezède is available for researchers and students who wish to publish a documentary corpus on an artist, a work, a venue, a musical or theatrical phenomenon. Modelled on a spirit of interdisciplinarity, Dezède addresses itself to researchers working in different disciplinary fields: musicology, modern literature, modern and contemporary cultural history, performing arts, art history, history of dance, etc. Dezède offers a publication aid to researchers registered on a masters or doctoral programme (availability of authority records, appendix export module with page layout and automatic indexing) and the valorisation of university work (confidentiality of personal data, possibility to delay the online publication). Geared towards the development of innovative pedagogical practices in part financed by a BQE obtained in 2014 at the Université de Rouen, Dezède is also a support for university teaching, particularly for information technology and its methodology. Student personal accounts are linked to a group under the responsibility of a teacher. Dezède is an archival solution for institutions and for the promotion of the performing arts. The application is at the disposition of institutions who seek a secure portal for the valorisation of their heritage and their history. Between 2013 and 2015, three partnerships were initiated. Since 2013, students of the Masters in Musicology programme at the Université de Rouen have been working on the production of a dossier which contains programmes of concerts organised at the Fondation Royaumont. The concert seasons and audiovisual archives of the members of theAFO were published in 2014, and are freely accessible in Dezède. The Opéra Comique archives have been searchable in Dezède since 13 November 2014. Their publication was made possible through a delegation to the CNRS (IRCL, UMR 5186). Each user is the owner of their data. By generating them from their account, the user (researcher, student, institution, etc.) automatically becomes the author and owner of them. This output offers a total transparency regarding the ownership and provencance of the data. This choice of name was decided during lunch on 23 February 2012, when Joann Élart, Étienne Jardin, Yannick Simon, Patrick Taïeb and Bertrand Bordage addressed the issue of what to call the application. A word was needed that could embody the project: the seductive Carmen and the iconic Boieldieu were mentioned before ceding to Dezède. Patrick Taïeb's proposal seemed obvious to everyone: the name is an enigma in itself... And a data-processing tool needed to be invented to perhaps solve it one day ! 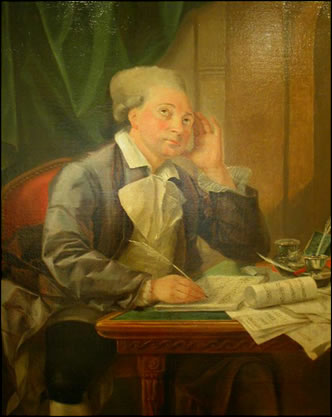 Jean-BaptisteGreuze, NicolasDezède, oil on canvas, Galerie Saphir. The logo draws its inspiration from a manuscript conserved in Rouen. It reproduces the author's name that appears on the title page of Auguste et Théodore, more specifically the example conserved at the Bibliothèque municipale de Rouen - manuscript copy [Théâtre 52. It also acts as a tribute to this theatrical library which played a fundamental role in the emergence of the Dezède project. The logo is not strictly speaking a reproduction but a creation by Bertrand Bordage through vector drawing, inspired by this reference. Dezède has been a registered trademark with theINPI since 12 December 2013 under National Number 134056592. Dezède has its origins in a research programme on l’histoire du concert en France led by Patrick Taïeb and Hervé Lacombe, and in the historical investigation method based on the reconstitution of concert programmes from the press and archives. Formed around the post of Patrick Taïeb at theIUF between 2000 and 2005, then around theANR 06-BLAN-03448 between 2006 and 2009, this research programme was shared over a decade by dozens of researchers around the world: Joann Élart and Yannick Simon were very active amongst these. If the efforts to design a computer-based tool were not successful in this period, the experiences acquired have nonetheless established a set of specifications to achieve it: the long-awaited solution should be long-term, free, secure, flexible, unlimited, participatory and dematerialised. On this basis and wishing to expand the method to all performances, Joann Élart announced the launch of the Dezède project to his collaborators in October 2011, following the first contact made with Bertrand Bordage, the designer of the computer programme. Study day at the Opéra de Rouen Haute-Normandie: Meeting at the Théâtre des Arts de Rouen ! To date, Dezède has been developed exclusively by NoriPyt, following the methodological guidelines of Joann Élart. The design has been implemented by Bertrand Bordage and Joann Élart. the quest for a high stability by the implementation of a suite of automatic tests covering the vast majority of its functions. See our GitHub repository for more details.